These hard to find Chips have hard to define bags. The locally distributed brand made in Ohio has what will be familiar to locals; checked top packaging, along with dated by around half a century graphics. 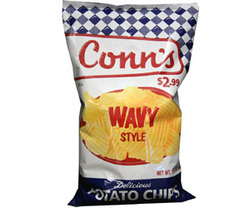 Although still fairly thin, they must have been thicker than Conn's other Chips because there were not a substantial quantity of broken Chips in the bag, and the crunch was superior to any of the other flavors. This is almost certainly down to the substance provided by the Ridged nature of the Chips. It was still a softer chomp though which must have something to do with the type of oil used in the cooking process. Marcelled Chips are a thoroughly good way of making regular Chips that bit thicker, but without going for the Kettle Cooked option. The Ridges are wide and fairly deep. There were not too many broken Chips in the bag so the ripples obviously provided a level of stability. There was not much seasoning but a fairly large amount of oil to grease fingers. We are of the view that the UK definition of standard, original or unseasoned Chips, should refer to all non-seasoned Chips - Plain. However, these are not quite Plain in flavor. The soybean oil the Chips are cooked in provide a different to usual taste. The warm potato flavor is really brought to the surface of these oily Chips. If you were brought up eating Conn's it is likely that other Chips will not compare favorably.